The village of Hamschik sits on edge of the Bitter Moors in Wasteland. It is only a small community of pig herders, coal burners and other serfs that mostly work to pay for the little protection the local lord, Hans Gruber, offers against beastmen of the moors, green skins of the Pale Sisters and the raiders from the North. Right in the middle of this small village next to the old well stands the Three Knights Tavern the only notable man-made location in miles. It is ran by a striking Ulrika Grünkopf with his three young sons. Three Knights doubles as a local town’s house where important meetings are kept and where the locals might learn the news of the outside world – if they cared about such things. Ulrika’s husband died two years ago fighting in the army of Empire and even though suitors have come from quite afar Ulrika has yet to re-marry. According to the old midwife Sigrid Ulrika is being courted by lord Gruber. Ulrika herself neither acknowledges or denies this rumour simply choosing to keep her personal matters to herself. Another notable feature at Hamschik is the Roteblüte, a great big oak that weirdly blooms red flowers during summer. The blooms smell lovely but there no insects ever land on them to gather their pollen. A half-remembered song tells that Roteblüte was once a brave captain in the Emperor’s army who never married nor had sons. Mórr took petty on him and let his soul to linger in the tree waiting for a young maiden who would smell the flower and be conceived by it. Some years ago a Witch Hunter of the Order of the Flame came to Hamschik. He studied the dead and suspected it was tainted with chaos. He ordered the men to hew it down and burn the logs but when the men took axes against the tree the Witch Hunter suddenly ordered them back. He offered no excuse for his actions simply stating that the tree should stand. Later that evening he left the village for Altdorf. It seems like we are in for another treat by Sami Uusitalo. Just last month I was proud to host his huge adventure The Queen of Embers and now he sent in another supplement! Here is a short supplement for Warhammer Fantasy RPG written as an in-game document (and could be used as such). 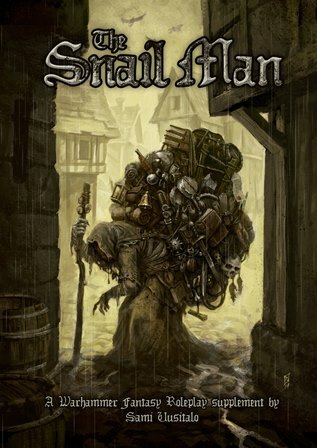 The supplement aims to inspire the GM by introducing several different theories about a mysterious NPC called the Snail Man that can be used either as a villain or an ally – or just a curious character to enliven your games. Download the PDF and see if that trip to Mousillon would be a good idea! Presented as earlier without proofreading. The last part introduces the “Eldorado” of Grey Mountains – a mountain that consumed all the wealth of the mountains. It was to be the pinnacle of the campaign, a site where the fate of the Old World would be changed. Now that I think of it, it might have been the working of the gods of chaos that this campaign never played out. It did not include any chaotic elements, only greenskins, men and women of Empire and Bretonnia (some dwarfs, sure) and a whole bunch of monsters and undead. According to legends there is a mountain somewhere in the Grey Mountains that the dwarfs call Karag Elgramazul (The Volcano of Weak Metal) and those few men that have heard the legend the Tainted Peak. According to ancient dwarven sagas it is where the mages of Elves cast a terrible spell during the War of Vengeance. The spell drained the all ore from the mountains into the mountain where it created a lake of permanently molten metal. Even dwarfs of the Grey Mountains doubt this legend as there are no written records of such an event and even though some foolish beardlings have tried, no-one has ever found this accursed place. The legend has its roots in reality even though it was of no such magnitude that the legends claim. During the War of Vengeance (or the War of the Beard if asked from high elves) there some fighting at the Grey Mountains as they created a natural border with the lands now known as Bretonnia and Empire. A group of elves were tasked to guard the few waystones set high up on the peaks of the mountains and they tried to serve their orders the best the could. Filled with hatred against the elves the dwarves tracked this band of swordsmen and mages and found that they had erected a waystone on one of the highest peaks of the mountains. Caring not of the reason this was done the dwarven warriors attacked the elves without a moments hesitation and left the elves no other choice than to protect themselves. Before the axes of the dwarfs the elves fell and finally there was left but a single mage to protect the monolith. Seeing the blood-lust in the eyes of the dwarves the mage cast a potent spell of Chamon trying to rid the dwarfs of their weaponry. Either by the power of the waystone or by some other unseen force the spell did what it was supposed to and more. It liquefied the armors and weapons of the dwarfs but also sucked all particles of metal from the dwarfs themselves too. In an instant the top of the mountain had turned into a site of massacre mutilated dwarfs and elves everywhere. The horrible event and the surge of energy were too much for the mind of the elven mage. His mind broke down and he became obsessed by the power of the waystone. The once great obelisk was infused with the metal stripped from the dwarfs, elves and the mountain itself. It became a cruel idol of golden energy that the elf worshiped with sacrifices of blood and magic. The mountain, the dwarfs and the elfs were soon forgotten. The War of Vengeance ended and the Time of Woe began. The dwarfs did not venture to the Grey Mountains as it had always been known for it low quantity and quality of minerals. Now and then a small expedition wandered to the mountain and from those that survived the elven guardian the legend of Karag Elgramazul began. Disclaimer: As my earlier FFG thread has been lost in the abyss of what can mockingly be called “customer service” I just paste these here. The following are the non-proofread notes I wrote one and a half year ago when we started a new WFRP3 campaign. While pondering about starting a new campaign (haven’t even decided the edition yet…) I stumbled upon these. I don’t think I’ll have the time to re-write them or add any material to them so I just give them to you as inspiration. The Winter of Warlords is written as a series of adventures coming together as a campaign. It will take the Player Characters from comfy summers of Empire to harsh winter of the Grey Mountains. The basic structure for the campaign assumes that the PCs take an active role in a border patrol that has been sent from Ubersreik to secure the Gray Lady Pass after the assassination of a Bretonnian noble. They will be the negotiators, spies, scouts and warriors of Empire against a threat that has nothing to do with chaos. Chapter 1 – Introduction: Includes introductions to the campaign by explaining what has happened before and who the characters will get involved into it. Chapter 2 – Background: Covers the information about the Grey Lady Pass and the area around it giving the background to the campaign. Chapter 3-X – The Adventure: The adventures in the Grey Mountains are divided into different chapters to ease their use as separated adventures if needed. They include interludes that weave the chapters together into a complete story of betrayal, greed and war. Chapter Y – Appendix: Is where you will find the necessary GM references and rules that are needed for running the campaign. NAME HERE is a trading post used by the dwarfs of Karak Azgaraz to trade with the humans from Bretonnia and Empire. It is here that the PCs have to use their cunning to learn about what has been happening in Bretonnia since the assassination. It could also prove to be a good point to begin negotiations with the dwarfs about coming to aid their ancient ally against the forces of Lady of the Lake. La Maisontaal is a sacred abbey located in a sweet valley in the middle of the mountains. It is well maintained and could prove crucial if a war between Bretonnia and Empire would brake out. Parravon is a mighty fortress build on the very rocks of the Grey Mountains. It is from here that the Grey Lady Pass is guarded by Bretonnians and it is the seat of Duke Cassyon of Parravon. The characters will have infiltrate to the court of the duke to learn about the treachery of Sir Chloderic. Sanglac Castle has been lost to Bretonnia since the greenskins overran it a century ago. It has become known as a cursed castle as even the greenskins seem to have problems controlling it. In this chapter the characters travel to Sanglac to investigate its mysteries and to see if it could be used by the forces of Empire. Get back tomorrow for the second part of these notes “Grey Mountains”. It has been a very busy week for me. I’ve managed to make the first draft of my work for LF9 and still I found the time to write quite a lot for a new Blasphemous Cults article. If the name Malal brings a renegade smile on your face I hope you’ll not be disappointed. As rumors go I’ve heard that the LF8 is going to be released during the first week of August (that is any day now! ), Sami Uusitalo is writing a little something new too and FFG going to keep a seminar about WFRP during next Thursday! I’ve also hosted two new files that have been lost from the Chaos Realm that is Internet, The Forbidden Blades and The Theater of the Damned both by Sami Uusitalo and his magnificent team. edit: Wrote another one-sheet: The Well of Light is a Lovecraftian encounter on a strange farm where knowledge was searched too keenly and an adventure seed about getting two giants drunk.